Childrens cotton bathrobe personalised for boys or girls. Childrens cotton bathrobe personalised for boys or girls. 100% cotton kids kimono style robe in terry toweling material for comfortable warmth combined with easy care and quick drying. Have a short name or initials on the front left chest and select the Embroidery Motif you prefer. Click the Green Link to view the designs we have, to select one - single click it. Your choice of thread colour and font style for the name. The design will be sewn to coordinate. 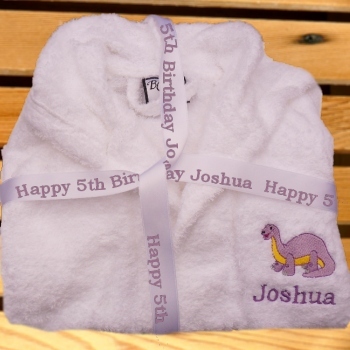 This kids robe is an extra special gift with a personalised printed ribbon tied around for presentation. The ribbon can indicate who the gift is to and from. Or the ribbon can simply have the occasion such as Happy Birthday!